Yes you can get paid to blog, how? Get yourself a free blog online, start writing whatever you want to blog about and start getting paid! It also help if you already have a blog that you already post on because then your blog has been online and has a reputation. 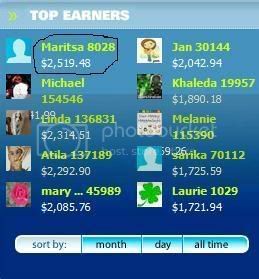 My main money maker is PayPerPost because I have made thousands of dollars and the pay via paypal. This site is so awesome because once your blog has been approved in their system, you can then choose what reviews you would like to write, so many different types and you do get paid for writing them. They pay on a 30 day basis but if you do a post everyday after the 30 day period, you will be getting paid every single day like I am and many others. And no you do not get paid pennies, you can actually make good money. I have been averaging $50-$100 per DAY. Wanna see proof? Just ask me and I will gladly show you. advertisers pay the company and the company pays you. You have a blog, its your own blog, you control it so its up to you to maintain it. With ppp, you log in and there will be opps available to you or not. Depending on what your topic is about and what the advertiser is looking for. Most of my blogs are general, which is a common topic of blogs that are looked for. or cheaper depending when you buy, usually under $10 for a name but you will make that money back no doubt! Smorty pays bloggers weekly, I can honestly say that I have been paid, they do not have that much campaigns but being in their system will still help while seeing if there are any tasks available. I Love, love, love them because you dont really have t write a review, just place the text link in any of your post and get paid every teo weeks, not bad and they really are awesome and a geat place to start. Great place where as a blogger you choose the advertiser and bid how much you want to get paid for it, you will be notified via email that you have the task and start writing. Thank you so much for this! I cant wait to get started on a second blog so i can do all the ads and stuff:) this info is worth alot! Hi, Razz. Thanks so much for this information. I'm looking forward to getting started. I'm disabled and if I can make money this way it would be a huge blessing. By the way, love the bunny! I have to wait until my blog is more 'mature' to do the payperpost...but Im still real excited. yeah i only started my blog so i have to wait too Razz are there any other blogs that don't require your blog to have a history? Thank you Razz for the good tips! I look forward to my blog being mature enough to utilize these tools. Thank you for all of your help by the way. You don't know what you have done for our family. thanks for sharing this.... im a newbie and seeking help on how to get started. well hope you can visit my site and let me know what you think! I read your blog several months ago and started one myself but didn't keep up. I've started it back up again and plan to submit it to the sites you recommended. Thanks for being so helpful! I am just getting started and would love any advice you could give me. My blog is melissaw09.blogspot.com. Let me know how I can improve. Also, I started the blog on Dec 3, so I have to wait until Jan 3 to submit it payperpost? The other sites take 3 months right? Thanks. I noticed that pay per post lowered there wait time from 3 months to 1. But I also notice a lot of the ops bar most of the poplar blog hosting sites like blogspot (the one I use). Is there a way to move a blogspot blog to an independent host either for free or cheaply? I am SOOOOOO excited. I hope this is for real. I started my blog today so I can get the 10 posts & 30 days in:) THANKYOU. I wish my blog didn't have to be 3 months old to qualify for the one I really want to go through. I'll have to take a better look at the others. Geesh you seem to earn a lot doing this! Great info.